This is the SIGGRAPH week, a week that most of my colleagues have prepared for several months. 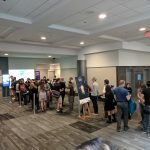 This year, our lab has a CAVE experience demo showing in the East Building, rooms 19/20 of the Vancouver Convention Centre in Vancouver, Canada. If you are currently in SIGGRAPH and reading our blogs, I highly recommend you to take a look. This is going to be another legendary mixed reality experience presented by our lab. Prof. Ken Perlin, the Director of the Future (short for the Director of the Future Reality Lab), will lead you to a brand new MR experience that nobody has been that far to perceive their feeling at the junction zone of present and future. But don’t worry, his job is to give you a glimpse of the realm that he directs, not to cause butterfly effect, he will guide you back before it is too late.